Google Apps or GApps is a package of Android programs which you need to install with Android Custom ROMs. All these Application are pre-installed with most Android devices, such as the Play Store, Gmail, Maps, etc. 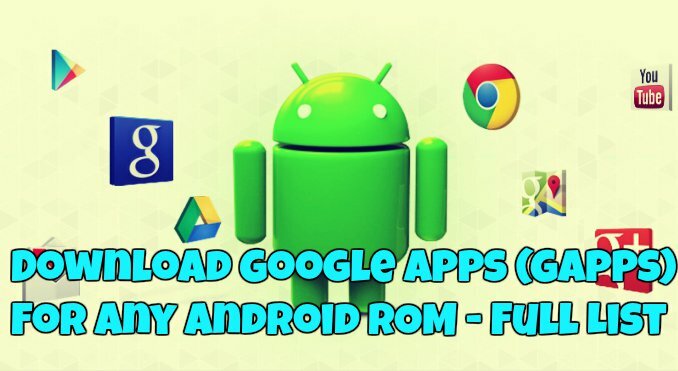 But whenever you try in flash the custom from on your phone then you need to flash them to install all the google application on your phone, without these Gapps package you can’t use any google service on your android like Plays store, youtube, gmail, Hangouts etc. Without any of this application, you can’t enjoy the full features of your android. While most stock ROMs come with Google Apps pre-installed, but if you are more into flashing custom ROMs then you need these Apps packages. Please, note you will have to flash the Google Apps package every time you install a new custom ROM. So in this guide we sharing the full list of Google Gapps (GApps) for any Android Custom ROM, whether it is Lollipop or Kitkat or Jellybean. To install these Apps you need custom recovery and all you have to flash the below mention zip file on your phone with the help of TWRP or CWM recovery. Currently my device is running on v.4.4.2 but I’m going to update to 6.0.1 rom is ressuruction remix, but while downloading from gapps what should I need to download like which version should i need to select while downloading in gapps? ?